This carrot relish is very versatile. It can be used in sandwiches or on toasts, as a perfect side for meat and fish, could be added to otherwise pale soups or just eaten as is. The combination of vegetables and just a few spices makes a difference between bland and delicious in this simple recipe. Heat the skillet on medium heat, add oil and carrots. Saute for about 5-10 minutes. Add onions, garlic, salt, peppers, saute 5-10 minutes. By that time all juices will evaporate, so add water little by little (about 2 Tbsp at a time) to prevent sticking to the bottom of the skillet. Reduce heat to low and stew for about 15 minutes. Add vinegar and bay leaves, continue to stew for some time adding water if necessary. The relish must be moist and all vegetables must be well cooked through. Vegetables will reduce in volume, so don't be disappointed by the yield. Taste your relish, be flexible and add more spices to your liking. The balance of spices for this recipe seem perfect to me, but you can feel otherwise, so be creative. Before serving remove all bay leaves and all or most of pepper corns. Serve warm as a side and cooled as a spread on toasts and sandwiches. 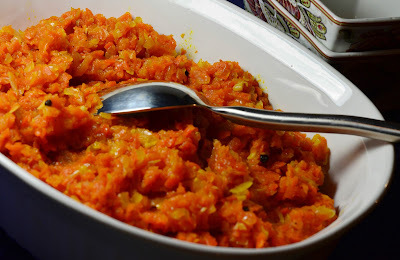 This carrot relish could be stored in the fridge for a few days - white vinegar works as a natural preservative. Just transfer it to a clean and dry glass/porcelain jar and cover tightly. If you are experienced with pickling, the carrot relish can be sterilized in glass jars for longer storage. That's what we did back in Russia on those days when grocery stores were near to empty. To liven up long Siberian winters, we always had a few choices of vegetable preserves, where the only preservative used was white vinegar.